Stay on Waiheke in our apartment close to Oneroa but in a quiet spot on top of beautiful Little Oneroa Beach (with playground, Little Oneroa Beach Store selling coffee, ice cream and much more, a fish and chip take away, free BBQs). The unit, part of the house with separate entrance and its own parking is just minutes away from charming cafes, restaurants, boutique shops and art galleries in the main village, Oneroa, including favourite venues like The Oyster Inn, VinoVino, The Cove and many more. * tea and coffee facilities (including tea and coffee :-), cereal and milk provided. * Cozy, sheltered outdoor area, including two deck lounger and a BBQ (in summer) and a beautiful garden setting with a little tree deck. * my choice of books in the apartment (I work in a book shop :-) ) and you can take it if you can't finish it but please leave another one! Since we have two cats and chickens which means eggs for you !!! we regret not to allow we love them :-) . We are located on a slight hill (but the property is quite flat). If this property is booked on your dates please have a look at our brand new place at same location called Four Huia! Seclude hideaway for two-five minutes walk above beautiful Little Oneroa Beach. We really enjoyed our stay in beautiful Waiheke Island and this property is ideally situated above Little Oneroa Beach which is a perfect scale for small children. Little Oneroa is a small secluded picture book cove with a range of facilities. The property is very quiet and peaceful well appointed and homely, and has a secluded shady outside eating area. Astrid and Marcus were wonderful hosts. Just far enough out of town to enjoy the quite. Highly recommend this place to anyone traveling to the island. Thanks for making this available to us. We had a great stay at Four Seasons In One Day - a great little home away from home. It was comfortable and had everything we needed - really enjoyed having a bbq and few cooking facilities to make some of our own meals. We appreciated the owner checking in to see if there was anything we needed. 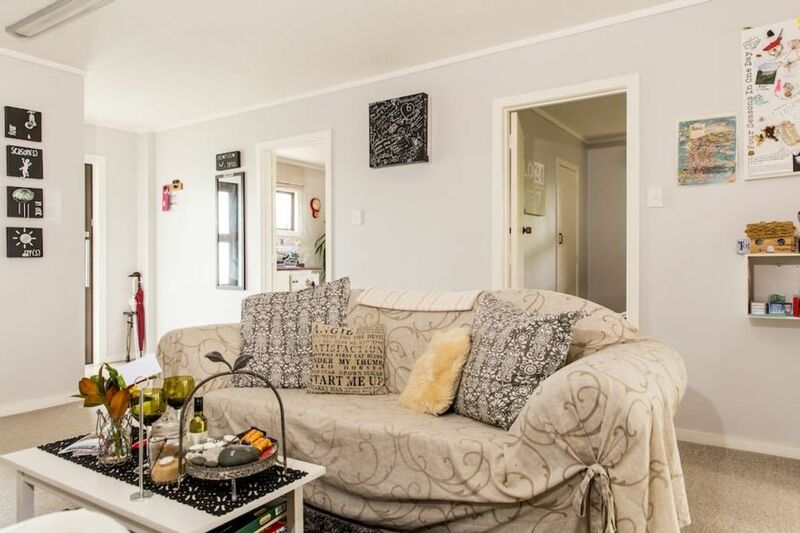 The location is a 10 min walk to Oneroa shops, close to bus lines for transport. Lots of lovely little touches and things to look at in this accommodation - we enjoyed the books, dvds and ltitle pieces of art. Thanks for our stay! Convenient location for walking to Oneroa Village (10 minute walk) and Little Oneroa beach (5 minute walk). Most things one would need for a short to medium length stay are there. We enjoyed our stay. The place is very private and so lovely designed! You will find lots of small things that make your stay comfortable and relaxed even with a child. Everything you need is provided. The place is very clean and has lots of natural light. We felt like at home, seriously. The host is friendly and helpful. Thank you very much! Hope to come again in the next year.